So “Geothermal Escapism” works on most of those levels, but it’s a little weird to me that the show took the final appearance of Troy and mostly made it a story about other people. I get why that was done, and I think the story as it played was more or less fine. But the show felt slightly separated from Troy from the very first episode this season, and to have that continue all the way through his departure was slightly disappointing when it comes to one of the show’s best characters. The final act of this episode, where Troy admits that he, too, is scared to be leaving but has to go, then takes his leave, is really great stuff, and it goes a long way to filling in some of those blanks. But if there’s a reason I hold the episode at a slight remove, it’s because of how the story seems aimed slightly off. The episode continues the season’s return to basics in terms of the concept episodes, parodying any one movie or TV show in particular less than it parodies a whole genre and largely taking place in the “real” Greendale, instead of some weird offshoot. (While I was thinking through other concept episodes to figure out why I felt like the show had gone to the “change Greendale into something even less realistic” well so often, I realized the series hasn’t done this all that often. Maybe last season’s finale—which did do some of this—completely broke me.) This is Joe Russo’s first episode as director since season three, and his eye for making the Greendale sets feel like they’re on some cavernous soundstage instead of a somewhat cramped TV set gives the episode much of its punch. Concept episodes work best when you can just sort of go with whatever they’re serving up, and Russo makes it easy to go along with the idea that a school-wide game of lava floor would turn Greendale into something out of a George Miller film. 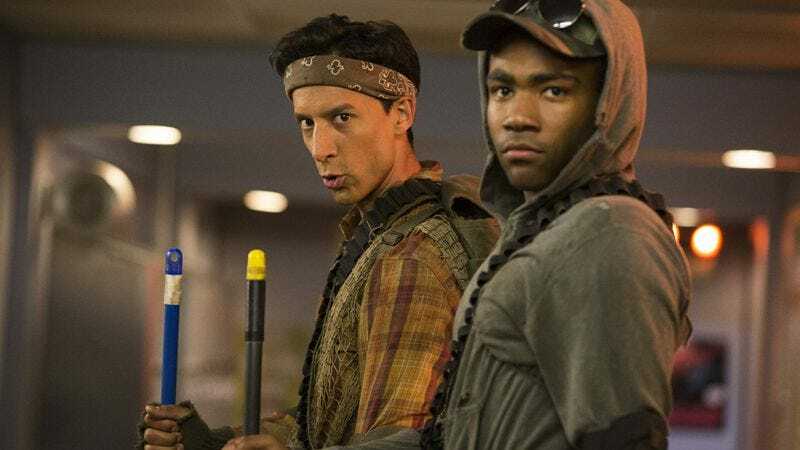 If “Geothermal Escapism” wasn’t going to be a Troy episode, then it would pretty much have to be an Abed episode, and it is that, but in a very roundabout way. The character of Britta (eternally my favorite on this show, which suggests I’m doing it wrong) got a little lost in the midst of season four and even the back half of season three, and I’ve appreciated season five’s efforts to reground her, though she hasn’t gotten very much to do. This episode changes that, and for a significant amount of time, this is the Gillian Jacobs show, right down to giving her weird hair and letting her ride alongside Hickey as his mistress of post-apocalyptic death. Jacobs gets most of my favorite lines and bits in this episode—I will never tire of listening to her and Joel McHale shout things at each other (this time getting distracted by who gets to start a knock knock joke)—but she’s also the character most reminding us this story has actual character stakes in addition to the “life and death” stakes established by the floor lava game. There have been some really good storylines where Britta tries to help Troy and Abed through something using her slightly skewed psychology skills, and the best thing about this episode is that it sits near the top for stories based around that particular character set-up. As far as the floor lava game itself goes, I mostly liked it with a few quibbles. There are scenes—particularly on Shirley Island—where it wasn’t always easy to tell that the characters were walking on tables and chairs, but for the most part, I liked the painstaking silliness of having the characters centipeding or inchworming their way down long hallways. Chang’s Locker Boys also amused me, particularly once we learned they apparently were doing all of this just for some M&Ms. However, one thing that might have been a little more clear was the geography of where everything was located and how the characters needed to get from one location to another. It wasn’t a huge detriment to the episode, but it sort of felt like the episode would set certain things up as incredibly difficult, then simply cut to whatever was next. It was, perhaps, a necessary shortcut in an episode of TV that needed to get to a lengthy concluding sequence, but it still felt like a potentially underdeveloped area. On the other hand, once the episode hit the third act, I thought it was mostly golden (and whatever complaints I have with the first two acts are so minimal as to be mostly brushed away by how strong the ending is). The idea that Britta couldn’t reach Abed using more traditional psychological methods and had to approach the question of his breakdown over losing his friend via the realm of make-believe, which is something only Troy could help her realize. I think what I like best about Britta is that she’s endlessly sincere. She might screw things up, and she might get far too into whatever she’s interested in in that moment, but she really, genuinely, does care about her friends and her causes and her school. She’s a mess, but she’s a mess who’s always trying to clean up after herself, and I find that character type fascinating. Plus, her idea of creating a clone of Abed that will be able to better deal with the emotions of Troy’s departure ends up being just what both of the guys need. Maybe the point of the episode where Troy leaves not really being about Troy until the very end is that leaving is just as hard on those left behind as those who actually go. Parting is an inevitable facet of life. We all graduate or move on from jobs, and we leave others behind in those places we once were or scatter to the winds. No one stays in one place forever, because that’s an inertia that ultimately can’t be overcome. Community has always given just a bit of itself over to ideas about self-realization and actualization, and this is another example of that. For Troy to become who he needs to be, he needs to shift into some other version of himself, and that means the story turns to other people, because his story is necessarily moving into a new chapter we don’t get to see. But we will stay with the people he leaves behind, and the final scene, where he says farewell to all of them is as good a sitcom goodbye scene as I can think of in recent memory. It could be a bit mawkish, but it earns its sentiment, and it closes with fan service, sure, but it’s fan service in the name of Levar Burton, so it works. Things are going to change, of course, but things are always going to change. There will come a point where Troy will be out in the middle of the Pacific with Levar Burton, and he might find himself longing to go back to Greendale, even though at that moment he can’t. Hell, there might come a time when Donald Glover might find himself wishing he’d never left Community, only to realize he can’t go back as simply as he might hope. I keep coming back to that idea of creating a clone of yourself because change is inevitable and rarely easy. We might find ourselves terrified by the new world we find ourselves in, wishing that someone else could deal with the act of rebuilding our lives, of being reborn. But, in a way, the second we make that choice, when we decide to change, one life ends, and another one begins. Change might not be easy, but if you can find a way into tricking yourself to making that change, you might find yourself living someone else’s life, a life you like better and a life that suits you more, yet not one that’s absent of that feeling of loss, that pang of regret that strikes in the middle of the night and comes complete with thoughts of faces and voices long gone, people you might never see again. And then you wake up, still you but also not. Is this the first time one of the characters has confirmed, in show, that Greendale is in Colorado? I am sure I’m forgetting something, but Jeff saying he’s never left the state is the only time I can think of off the top of my head. So did Britta win the comic book? I presume so, and I wonder what Britta will do with $50,000. Or maybe she’ll just let Abed keep it. That seems like something she would do. Just tell us what was funny, VanDerWerff, God! : I already mentioned Jeff and Britta’s fight over “knock knock,” which was actually the thing that made me laugh most, so let’s have as a runner-up that tag, where Troy asked all of the questions he’d always had about Star Trek, including some of my favorite questions that TV writers and actors always get asked (like whether there’s one writer who handles each character). I believe those were the dulcet tones of one Aimee Mann singing “Come Sail Away” at the end. I had flashbacks to the Freaks And Geeks pilot, which is not the worst subconscious association for the show to create in my mind. Script credit for this goes to Tim Saccardo, who’s quietly building a resume as one of the show’s more consistent writers. He handles this one with aplomb. Hickey is going to shove Britta once the game is over. Also, Duncan has mostly gotten as far as he has by pushing girls off of things. In just about any other context, “Troy and Abed in a bubble!” might have set my teeth on edge, since the show has run that joke into the ground, but it would have been inappropriate to not feature some variation on this gag in Troy’s final half-hour. Hey, did you guys know that Britta getting Pierce’s iPod Nano was a callback to the season one episode “The Art Of Discourse”? WELL IT WAS. SEE YOU NEXT WEEK. THEN I THINK WE’RE OFF FOR THE OLYMPICS FOR A WHILE. GOODBYE.